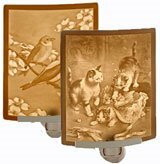 We are proud to offer these amazing lithophane night lights, lamps and luminaires by The Porcelain Garden. The artist who created Porcelain Garden revived the lost 19th century European art of the lithophane in 1982. Photos don't do justice to the amazing beauty of these works of art, which come to life when illuminated. These night lights are not mass produced, but instead are artisan-made in a small workshop in Irvine, California. Each Porcelain Garden piece is made in the USA. How are these fantastic night lights made? The image you see is not printed on the night light. The lithophane process produces the image by simply varying the thickness of the translucent porcelain. The ability to infinitely vary the thickness of the porcelain produces amazing detail. These fabulous and functional works of art are surprisingly affordable, considering the skill and talent involved in the production of each one. Proudly designed and produced in California. Porcelain Garden nightlights make wonderful gifts. Bulb included.